My sister found this black and white aztec print fabric at JoAnn's a while ago and used it to make her baby bibs. She showed me a picture and I immediately went to buy some but my JoAnn's didn't carry it, so she bought the rest of it at her local store and sent it to me :) I stewed over what I would do with it, some leggings, a shirt... but then I decided I wanted to be able to see the fabric all the time so I made a throw blanket. It is a jersey knit, so I just folded the black and white fabric over to make a little hem and sewed some black fleece to the other side of it. 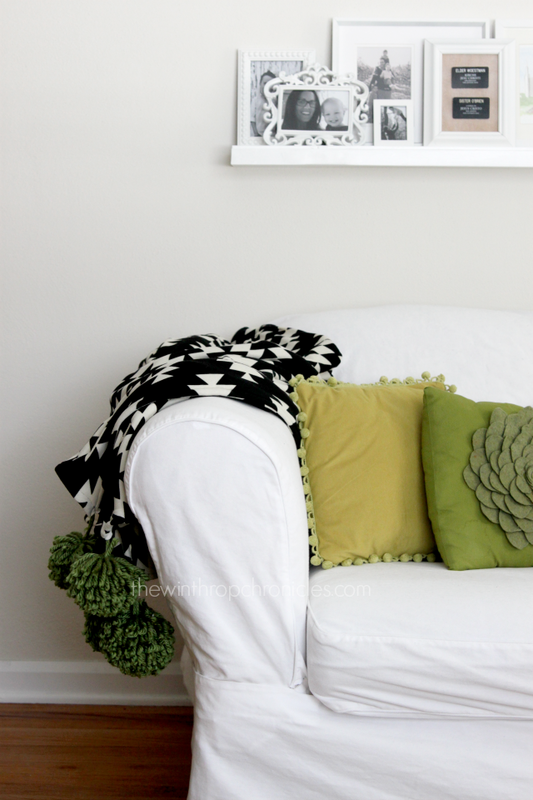 Then I saw the idea of adding pom poms to it on this blog. I made some pom poms for my daughters room and share a tutorial here. For these, I just made the pom poms a little bigger and tied a knot in two strings-like in the picture below. Then I tucked the knot in to the corner of the blanket and sewed it in there.